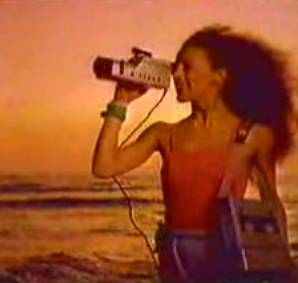 In 1983, Panasonic presented a bold future of videography, one in which cameras adjusted exposure and focus all by themselves, and we would sling portable VCRs over our arm to film ourselves doing interpretive jazz dance as the sun set over the Pacific. We would have terrific legs and short shorts, and dance with the sheer exuberance auto-focus inspired … until we realized we neglected to move the tripod as the tide came in, and our expensive Panasonic gear floated out to sea. It’s nice to hear Panasonic’s old slogan “Just Slightly Ahead of Our Time” — an atypically pragmatic marketing slogan. (Like, “Futuristic Looking for At Least a Few Months, We Think.”) Maybe even they knew this whole clunky VCR – docking station wasn’t going to catch on. Yet, I still kinda want that camera. Via stepheno.net, a Norwegian TV and Media Production student, and TechEBlog. Kitten Does Electro 101; Where are the Synth Pooches?